The furnace’s flame is yellow hue instead of blue hue. Extra moisture found on windows, walls, or other cold surfaces. Rusting on flue pipes or other pipe connections. Streaks of soot around furnace. If your furnace shows any of these signs, leave your house immediately and call your utility company to turn off your gas. You should then have your furnace looked at to see if there needs to be any major furnace repairs. You should consider having both carbon monoxide detectors and smoke detectors throughout the house especially if you have a multiple story home. You should also maintain them regularly, so they are working properly to keep you and your family safe. You can test the alarms using the button on the front at least once a month. Change the batteries at least every six months and replace the alarm at least every ten years. How to Tell If Your Furnace Is Safe? Modern heaters are now safer than they ever have been before, which include safety switches and more precautions to prevent leakage with carbon monoxide or the chance of the furnace overheating. 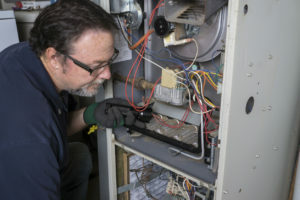 When you are getting a brand-new furnace or you need one to be repaired, do not call a local handyman or someone who thinks they know what they are doing. Only allow a trained professional do the work on your furnace. Trained technicians are the only ones who can spot a problem right off the bat and help prevent a safety issue. When you are looking at your furnace, you won’t be able to spot a threat to you right away. You may also need a new furnace if yours is more than fifteen years old. If your heating bill has increased, it may also indicate that the internal life of parts may be wearing out. If this happens, it means that your furnace may quit on you for good. 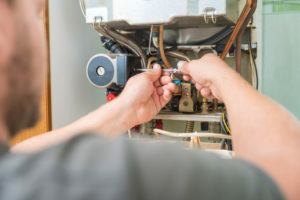 If your furnace makes strange noises when it comes on might mean something needs to be replaced, or you may even need a completely whole new furnace. Your furnace should not be making banging, popping, or rattling sounds. It also shouldn’t be blowing cold air or turn off and on all the time. If you have to keep adjusting the thermostat because your rooms are too cold or hot indicates that your furnace can’t distribute the heat amongst all the rooms of your house anymore. These are all good signs that you may need a professional furnace repair company in Pocatello to come examine your furnace. Southeast Idaho isn’t a stranger to cold winter weather and there is nothing more frustrating than a malfunctioning heater during the winter season. Because our daily activities are primarily focused inside, we need our heater to work efficiently and effectively. Failure to properly maintain your heating equipment can cause tremendous stress and inconveniences. The National Fire Protection Association reported, “Heating equipment fires accounted for 16% of all reported home fires in 2009-2013.” The Federal Emergency Management Agency also reported, “During the winter, heating fires jump to 27% of structure fires.” And the leading contributing factor related to home heating fires was due to lack of cleaning. You can save yourself from the hassle and threat of a house fire by following these 4 tips to prepare your home for the winter. As the weather continues to cool, it’s recommended to test your furnace by turning it on to make sure that it’s running prior to the winter season. You don’t want to wait till you need the furnace to realize that it isn’t working properly. During this test, you will want to adjust the thermostat from air conditioning to heat. If you have a high-efficiency thermostat, you should be able to set the time(s) of day you want the heater to run to maintain your desired temperature. After months of your furnace sitting unused, dust and debris build up can cause your furnace to clog and work improperly. If left unattended the threat of a fire grows ever more likely. During an annual inspection and cleaning, an inspector will go through a series of processes to verify your furnace pressure is accurate and discover if there are any leaks, rust or misalignments that need to be repaired. Scheduling a cleaning and inspection early can save you time, money and hassle down the road. Depending on the use and the amount of dust, pet dander and allergens in your home will depend on how often you should change your air filters. It’s recommended to replace your filters every one to three months to reduce debris build up. Additionally, make sure all heating vents and return registers are unobstructed. Blocked vents don’t allow air flow, and can also cause your heater to work overtime and over heat. An overworked heating system can cause inefficiency, resulting in needed repairs and a shortened lifespan of your heating system. If you have leaky windows and doors, hot air will escape through these cracks. Preparing your home by sealing window panes and door frames with silicone caulking or rubber weather stripping can save you from an expensive energy bill. By planning ahead and scheduling our licensed technicians to inspect your heating system early, we can save you time and money. The contractors at Barlows Aire Force One have the knowledge and tools to clean, inspect and repair your heating systems to make sure it runs effectively and efficiently, just when you need it to. Fall is quickly approaching and before we know it we’ll be drinking hot chocolate, eating pumpkin pie, and buying more pairs of gloves and coats than imaginable. In order to prepare for this wonderful season, it’s important to think about your home. Usually overlooked in typical fall preparations are furnaces. However, furnaces are critical to maintaining your holiday season excitement. Honestly, how fun is a malfunctioning furnace? A large portion of accidents involving furnaces are caused by faulty or malfunctioning parts. While cranking up the heat during fall seems innocent, there have been fatal accidents. Harmful poisoning can occur when your furnace emits too much carbon monoxide for a certain space. Another safety concern is the potential of a house fire. House fires are the most common result of furnace issues. When natural gas builds up in the home, an explosion can occur because of the volatile nature of gas. Regardless of the likelihood of an explosion, even the presence of natural gas in the air can cause extreme sickness, headaches, nausea, vomiting, and dizziness. Having a professional inspect your furnace will guarantee a safe environment for you and your family. Carbon monoxide poisoning is the last issue you’ll want to deal with during your holiday season. Professionals will also perform a thorough inspection for flammable dirt and debris. One of the advantages of having your HVAC unit checked annually is increased efficiency. As you probably know, fuel for heating is very costly. An inspector can analyze the efficiency of your system to see that your HVAC system is burning fuel at an economical rate. Although it may seem like a headache now, employing the knowledge of a professional technician will lead to lower bills and less fuel consumption. Spending a small amount of money on prevention will save you a large, heartbreaking bill in the middle of December. Make sure that yearly service is performed before winter to confirm the reliability of it during the cold winter months. There are specifically outlined steps for a HVAC technician to follow while inspecting your furnace that will ensure a worry-free cold season. Although it may seem unnecessary, it’s like going to the dentist. You may not think you need it, until something goes wrong. 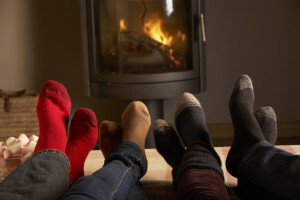 Invest in a happy holiday season with a furnace inspection. You’ll thank yourself later! Always remember that Aire Force One is available for any of your furnace needs. Give us a call at (208) 240-6719 today.